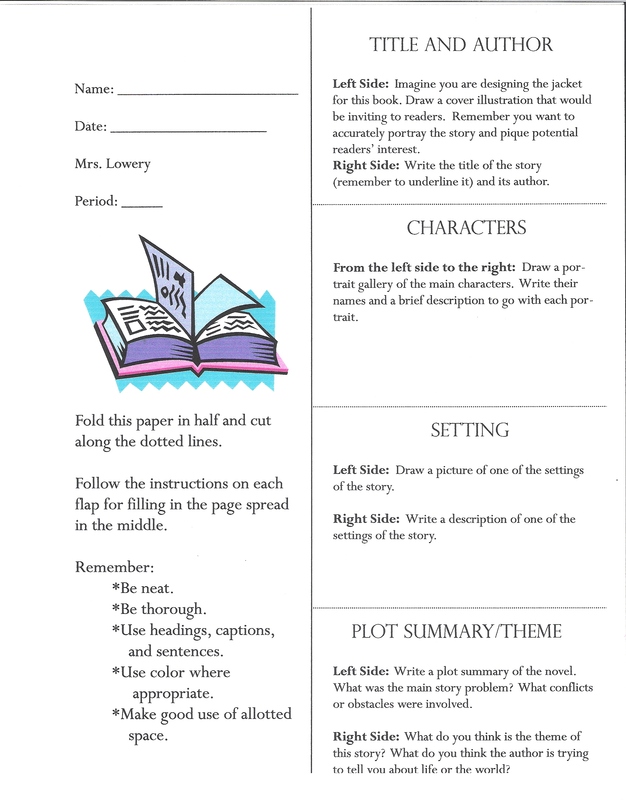 A “Lift the Flap” Book Report does not take a lot of materials, space, or time, yet it provides students an opportunity for writing and creative expression in reviewing elements of fiction that helped make the book unique. All your students need is the one page hand-out, a pen or pencil, crayons, colored pencils or marking pens, and scissors. Prepare the hand-out as shown in the illustration. Provide each student with a hand-out and provide either class time (a period or two should be enough) or assign it as homework. Completing the book report will enable students to consider and display their knowledge of characters, setting, plot, and theme. Combining writing and drawing allows students share their understanding of their reading using multiple modalities. Illustration of a Setting 1 pt. Description of a Setting 1 pt. Use of Complete Sentences 2 pts. Use of Color 1 pt. Use of Allotted Space 1 pt. “Lift the Flap” Book Reports were fun for my students to produce and fun look at. I enjoyed the creativity displayed in them, yet also had the satisfaction of seeing my students express their thoughts in complete sentences. I hope the “Lift the Flap” Book Report brings fun and creativity to your classroom.